The Freedom EVO® platform provides straightforward solutions that allow you to work more efficiently and adapt quickly to new requirements. 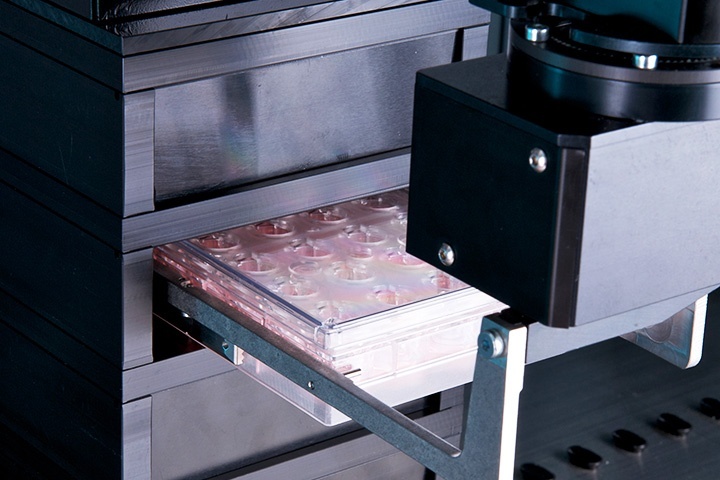 The RoMa arm transports microplates and other labware quickly and efficiently between worktable, peripheral devices and labware storage. The extended range RoMa Arm offers access below the worktable, enabling further integration of devices such as plate readers, washers or centrifuges, as well as additional storage and incubation options. The PnP arm offers fast and precise single tube movement, for example, for tube weighing and compound dissolution applications. A RoMa is moving plates from a storage hotel to the worktable for further processing. A RoMa is removing lids from micro plates. A RoMa is replacing an empty with a new box of disposbale tips. A RoMa is demonstrating the area where a micro plate can be potentially placed. A RoMa long z is removing a plate from a Hydrospeed washer which is placed under the worktable. Scientists at Berlin’s Technical University of Applied Sciences Wildau have established a screening platform for phototrophic organisms on a Freedom EVO® 200 liquid handling platform equipped with an Infinite® M200 PRO microplate reader. The upgradeable Freedom EVO platform can evolve with your changing application needs, making your initial investment even more valuable.